Yosemite Park in Eastern California is one of the most beautiful places in the United States. If you are in to hiking, camping, mountain climbing, biking, and beautiful scenery, this is the place to visit. 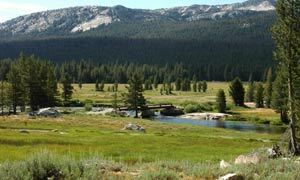 From the Yosemite Valley to the Tolumne Meadows to the giant sequoia groves, Yosemite is truly one of the most scenic places you will find. The Ahwahnee Hotel - A National Historic Landmark, the Ahwahnee is a wonderful place to stay. It has traditional hotel rooms as well as "cabins" in the woods with all the appointments of a standard hotel. The building itself is beautiful. When it was built, it was said to be "the Waldorf-Astoria meets Yosemite." While it's not quite that nice, it has serious charm to it, and by Yosemite standards, it's luxury. Even if you do not choose to stay at the Ahwahnee, make sure to visit it and check out the parlor (complete with huge fireplaces and wireless high-speed Internet access). The restaurant at the Ahwahnee is excellent as well, especially for breakfast. The prices for rooms at the Ahwahnee are extremely high (as much as $400 per night) and it sells out most of the summer, so make sure to book early. The Wawona Hotel - A mid-level hotel, the Wawona is a nice place to stay and caters to families. Its location at the gateway to Yosemite Park is not as convenient as the Ahwahnee and the Yosemite Lodge. Even if you don't stay at the Wawona, it's worth a stop at the restaurant, which offers good food at reasonable prices. The Yosemite Lodge - This is our pick for the best lodging value in Yosemite. 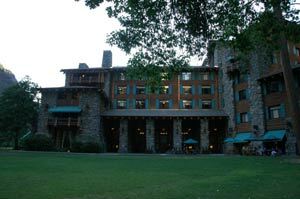 Much less expensive than the Ahwahnee, the Yosemite Lodge Hotel is almost as nice. There is little difference in the rooms, there is high-speed wireless Internet access in the lounge, and it boasts a fabulous restaurant with views of the Yosemite Falls. Tent-Cabins with bathrooms - The tent-cabins at Yosemite are inexpensive and adequate, but they are definitely not plush. Surprisingly, they are difficult to come by during the busy summer months, so make sure to reserve them in advance. Camp Curry is the place to stay if you are planning on staying in a cabin. It's the center of activity in the Yosemite Valley, and offers the most amenities, including bike and raft rentals, food choices, shops, and a grocery store nearby. Tent-Cabins with shared bathrooms - This option is for those who don't mind walking to (and sharing) bathroom and shower facilities. Given the other options available, we don't recommend this option except for those who are true campers but do not have their own tents. Campgrounds - This is the most "authentic" way to see Yosemite. Bring your own tent and chairs and mingle with the thousands of campers who flock to Yosemite each year. Again, the campgrounds fill up quickly, so make sure to reserve your spot in advance. Serious hikers bring packs and load up their tents to hike to the several high Sierra camps to sleep near the clouds and look down on the fabulous Yosemite Valley. True food connoisseurs will have to leave the Park's confines to find gourmet cuisine, but you will be happy to know that one of the best restaurants in the world is less than an hour's drive away. Take Highway 41 west from Yosemite to the small town of Oakhurst, and visit Chateau du Sureau. The small hotel boasts a fabulous restaurant known as Erna's Elderberry House. The prix fixe menu is to die for. Only French Laundry in Napa Valley offers better cuisine on this continent, and to dine there you must make reservations 90 days in advance and you will pay nearly double the price. The herb-crusted lamb chops, diver scallops over risotto, barramundi filet, and tuna tartar are worthy of five-stars. 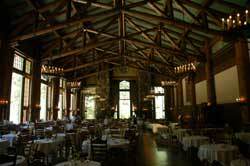 Inside the park, your best bet for fine food is to eat in the dining room at the Ahwahnee. Try the filet mignon with mashed potatoes or just have appetizers and enjoy the pate, scallops and mushrooms Wellington, and one of their fresh salads. Breakfast at the Ahwahnee is wonderful as well. They offer a full menu as well as a buffet with waffle and omelet bars. The restaurant at Yosemite Lodge is also quite good. The chicken lasagna was fabulous, as was the special entree salad for two. The view of Yosemite Falls from the dining room is breathtaking. In Curry Village, there is a pizza stand and taco stand that also offer surprisingly good food at a reasonable price. Rafting down the Merced River. 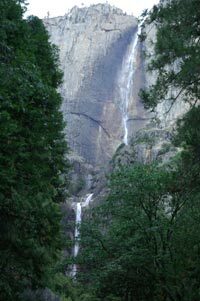 Hiking up to the top of the Vernal Falls (yes, there are 683 steps to climb, but it's well worth it). 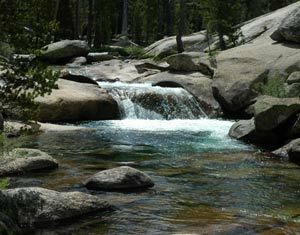 Drive up to Toulumne Meadows and hike to the Soda Springs. One of the most beautiful places we've encountered on Earth. 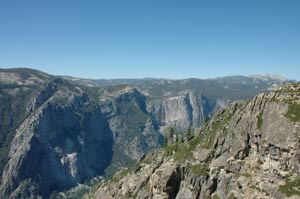 Drive (or hike) up to Glacier Point and stand in awe at the views of the valley below. 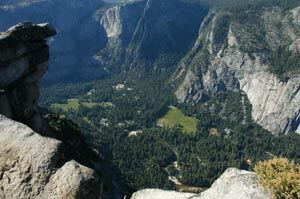 After leaving Glacier Point, stop off at the trail head and hike over to Taft Point. Another beautiful view of the valley as well as El Capitan, the largest granite outcropping in North America. Serious hikers should make the trek to the top of Yosemite Falls and should also hike to the top of Cloud's Rest for one of the best views of the valley. If you are in good enough shape, you should consider climbing to the top of Yosemite's Half Dome, aided by "cables" that allow climbers to get to the top without the need for climbing equipment.